Disembarking the massive cruise ship-sized ferry* that took us from Dublin to Holyhead in northern Wales, we went straight to the Hertz office where my father had arranged a rental car that we would return five days later in Oxford. The agreement was simple: he would drive, and I would navigate. Beside the fact that I hadn't been behind the wheel of a car for over three months prior to the trip, using a stick shift is a skill I have yet to learn. Dad, on the other hand, grew up on a farm and was driving tractors by age ten or twelve, and pickup trucks shortly thereafter - all manual. As we sat in our punchy red Vauxhall for the first time, I asked, "When's the last time you drove manual?" "Probably before your brother was born," he answered. My brother just turned thirty. One might think that driving on the opposite side of the road would be the biggest adjustment. Think again. Once we'd gotten closer to our first Welsh destinations, Caernarfon and Conwy, we stopped using highways and instead drove along narrow country lanes with encouraging signs that read "Oncoming vehicles in middle of road." Not to mention the occasional sheep and pheasants that liked to mingle with the traffic. Once we even descended a hill only to find that the road passed through a stream. It wasn't terribly deep, mind you, but had we been playing The Oregon Trail, we would have been prompted to ford the river. And, of course, there were the roundabouts, which exacerbated the jerkiness of riding clutch, and would have undoubtedly given my mother great anxiety had she been present. (She is possibly the world's worst backseat driver). Barring all of the above, however, the drive was wonderful. Imagine miles and miles of rolling green pastures dotted with sheep and delineated by low stone walls. The cinematic landscapes continued as we wound between hillsides made fiery with autumn leaves, weathered stone houses, and towns comprising a few hodgepodge streets at odd angles to one another. It was idyllic, like being dropped into the BBC adaptation of your favorite English Lit novel. As Wales gave way to England, the landscape didn't change so much, but the names of the towns we were passing became more pronounceable and descriptive (Stratford-upon-Avon, Moreton-in-Marsh, etc.). Even though part of the point of us going to the Cotswolds was to do at least a little trekking, the car provided unmitigated freedom and flexibility. *But seriously, it had multiple restaurants and a small movie theater. Side view of the tomb. I figured it would make me a bad anthropologist to visit Ireland without going to see some of its vestiges of prehistoric civilization, so on our second day in Dublin we took a bus up to Drogheda, then a taxi to Brú na Bóinne, whose tourist center manages access to several Neolithic passage graves dating back to 3000 BC. At this time of year only one, Newgrange, is open to the public. Resembling giant hobbit holes, the tombs consist of intricately layered sod and several types of stone that all came from many kilometers away. Like the iconic statues on Easter Island, the mystery remains how the large stones were moved across such vast distances before the invention of the wheel and 'modern' building methods. The results are stunning. The main entrance to the tomb contains an opening designed to align perfectly with the sun at the winter solstice, illuminating the otherwise dark inner chamber for about 20 glorious minutes each year. Visitors can enter a lottery for tickets to witness the phenomenon. The more historic sites we visit, the more I wonder what - if anything - from contemporary society will still be around hundreds and thousands of years from now. Probably nothing that would reveal any useful information to future generations of scientists. Who knows? Climate change may have very well wiped out humankind by then. 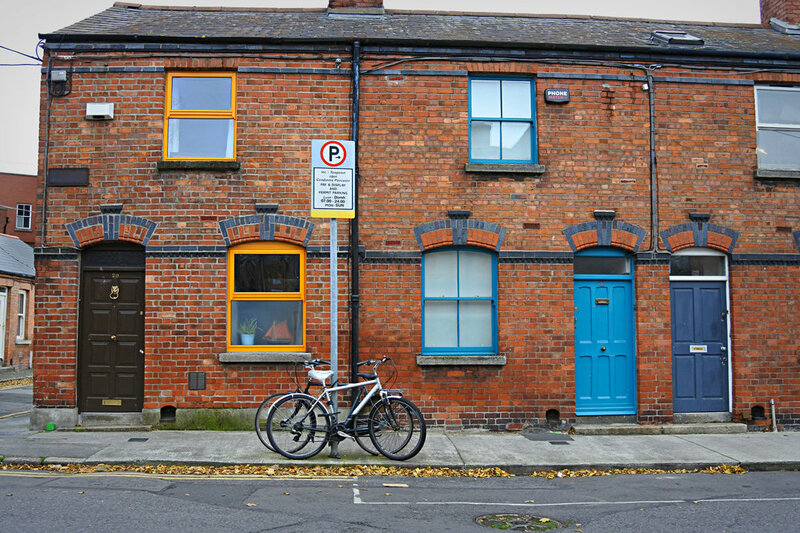 When establishing the itinerary for this trip I had to choose between Dublin and Edinburgh for our starting point. I don't remember why I chose the former (maybe flights from Stockholm were cheaper), but I'm glad I did. Dublin's food scene is much more Seattle or Portland than San Francisco, which I dread returning home to now that I know that there are places in the world where I can get just as good a meal at a fraction of the price. Highlights: beer-battered fish and chips at Fish Shop, classic pastas at Terra Madre, and the three-course prix fixe dinner for €27 at Camden Kitchen (because nearby Richmond was fully booked). Some photos below. See the rest on Flickr. Statue outside Christ Church Cathedral. John's Lane Church, near our Airbnb. 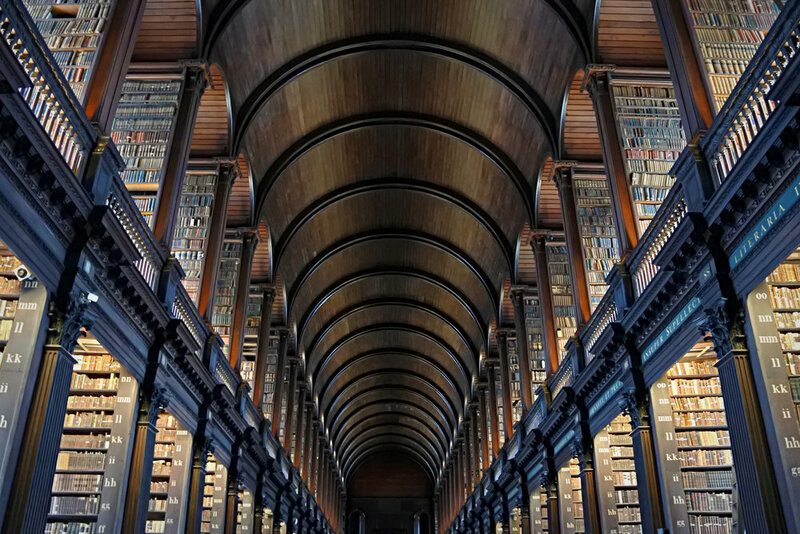 The Long Room at Trinity College. The weekend before I left Sweden my roommate and I took a quick overnight trip to Gothenburg. Our co-workers (even those who hail from the west coast city) scoffed, asking us in that semi-sarcastic-but-mostly-serious tone, "But what are you going to do there?" She has extended family there; I have a friend and former co-worker. And since we worked opposite shifts and never saw each other at the apartment, it was a nice pre-goodbye girls' trip. We wandered, shopped, had afternoon tea, commiserated over our respective boy issues, etc. 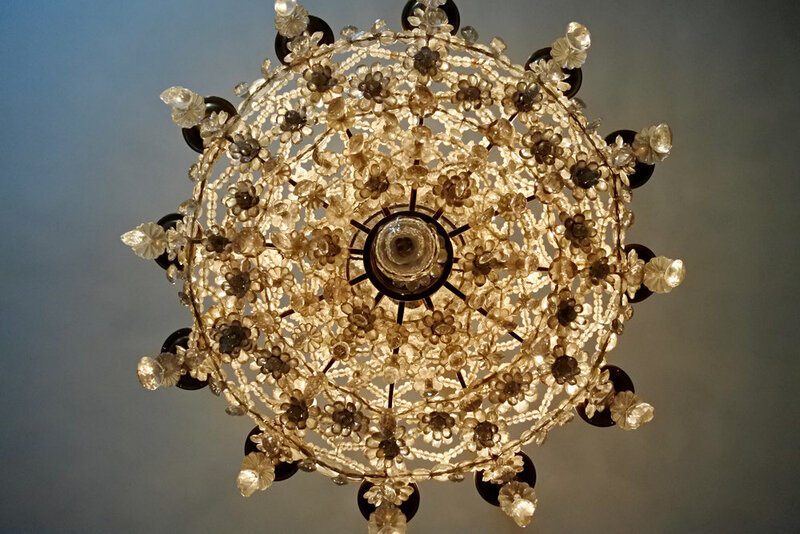 Highlights: delicious Italian food at La Strega, all the chic AF design stores in and around Inom Vallgraven, coffee at Da Matteo, pastries with the chocolate likeness of Gustavus Adolphus (former king and founder of Gothenburg), Slottsskogen park. Traditional sweets in old town. Slottsskogen - think a Swedish version of Central Park. One of two resident moose at Slottskogen. According to signs his name is Mooses. Another weekend after another four-day, fifty-plus hour work week. Praise be. Blessed be the fruit, etc. etc. Last week two of my dearest college friends were in town, so I got to show off the city I've come to know and love, make good use of my employee discount with the restaurant group's wine and cocktail bars, and cross some things off my Stockholm bucket list. 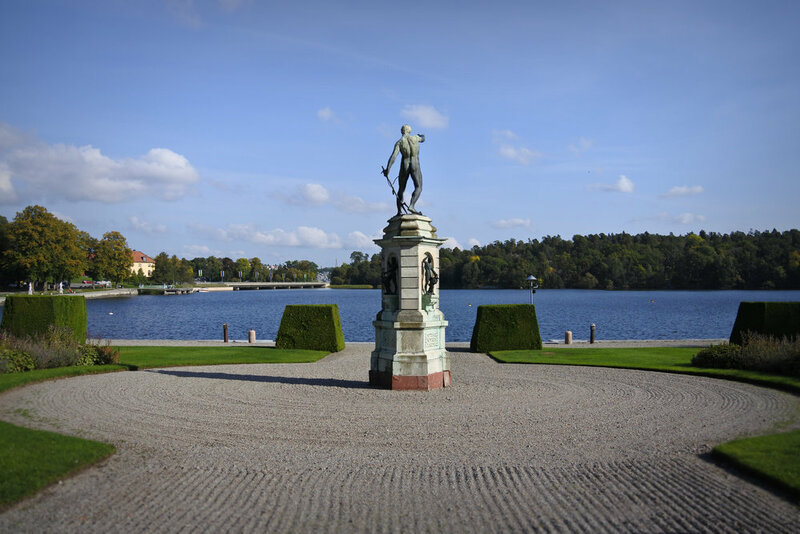 Drottningholm Palace, about 45 minutes away from the city by public transportation, is the main private residence of the Swedish royal family. Situated on the island Lovön, it's similar to Fontainebleau in size and scale. Geometric, Last Year at Marienbad-esque hedges and manicured gardens (including a random off-leash dog park) surround the mansion. And, on the mid-morning weekday that we visited, it was gloriously empty. Visitors are allowed to wander some of the palace's oldest and grandest rooms, as well as the Chinese Pavilion (a birthday gift to a previous monarch from her husband), with the purchase of a ticket, but the vast gardens operate as a public park. The 18 kilometer Antiquities Trail runs along the border of the entire property; my friends expressed interest but I was secretly glad that we opted not to do that. Photos below. Click to enlarge. Reverse shot from visitor's entrance. Theater, separate from main palace. The gardens are dotted with statues like this one. Stora Gatan, the main street in the historical city center. The weather here is beginning to turn. The trees still have their foliage, but the air is cool and crisp. More than ever one must continually check the hourly forecast for rain; I've taken to stashing an umbrella in my purse at all times as well as gloves. Last weekend I took the commuter train out to Märsta, northwest of Stockholm, and then a bus to Sigtuna. As I watched the city transition to suburbs, large buildings and parking lots gave way to open fields broken up by paved bike trails and cottage-like houses whose red clapboard exteriors made them resemble miniature farmhouses. 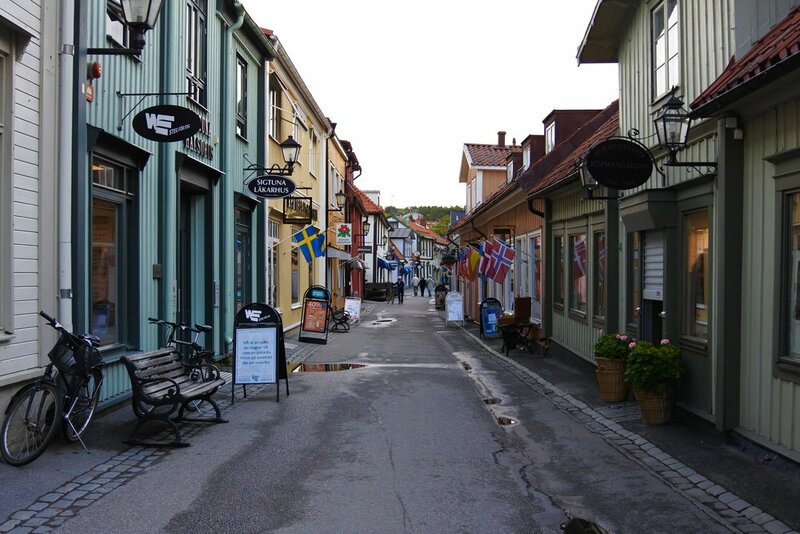 Situated on Skarven Bay, Sigtuna is a quaint town dating back to 680. Its medieval church ruins, Norse rune stones, and picturesque historic main street attract visitors, though when I went on a weekday morning it was pretty dead save for an elderly tour group. Rune stone near Sigtuna Museum. Nonetheless, I welcomed the tranquility as I wandered the quiet streets and observed ducks navigating the calm water after a rough work week. I stopped at Tant Brun's, a rustic cafe with low ceilings, antique wooden chairs and tables, and strong coffee served up in copper kettles that took a lot of milk to become, as my sous chef would say, "hamster-colored." (Fika, the Swedish concept of having coffee - and usually with a pastry, is something I've embraced whole-heartedly). Afterward I returned to Stora Gatan to admire its brightly colored and endearingly rickety shops once more before heading back to Stockholm, and reality. Another rune stone, this time near on the waterfront.